Having spent 30 years as a professional interior designer, Kathryn Lair reached a point in her career where she found it more fun and interesting to photograph buildings and interiors than to design them. The challenge of capturing the spirit or essence of a space, rather than just documenting it, captured her imagination over years of photographing her own work. Working with elements of light and shade, color and texture, scale and composition allows her to make a strong visual statement in the images she creates. Lair's love and understanding of architecture and her keen eye for design enables her to present the work of other designers, architects and builders in dynamic and compelling images that seduce the viewer and invite them into the space. 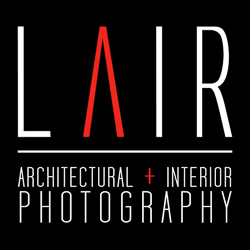 Lair's photographs have been used by clients for design competitions, marketing and websites and published in a number of online and print magazines, including Variety, FDLuxe, Modern Interiors, Design Guide Texas, D Home, American Farmhouse Style, Houzz, RenoCompare and AspenPeak Magazine. Lair left "city-life" behind 23 years ago to live in the tranquil and majestic mountains. But her work takes her all over the country photographing homes, ranches and commercial projects for builders, designers, architects and real estate companies. She lives in southwestern Colorado with her husband, two dogs and a one-eyed cat.